Our adoption medicine expert explains the importance of post-adoption check-ups, and what to look out for. Traveling to adopt my children, I witnessed firsthand the conditions in which they spent their early lives. As a mom, I saw the caretakers’ love. As a pediatrician, I saw crowded living quarters and lack of sanitary conditions. Before we came home, I treated lice and scabies passed to my daughter from her caretakers. But by the time of her first doctor visit in the U.S., my daughter was clean, free of skin diseases, and had begun to adjust to her new surroundings. Most pediatricians treating newly adopted children can’t judge potential risk factors based on firsthand observation. They must rely on what parents tell them about their children’s early lives. 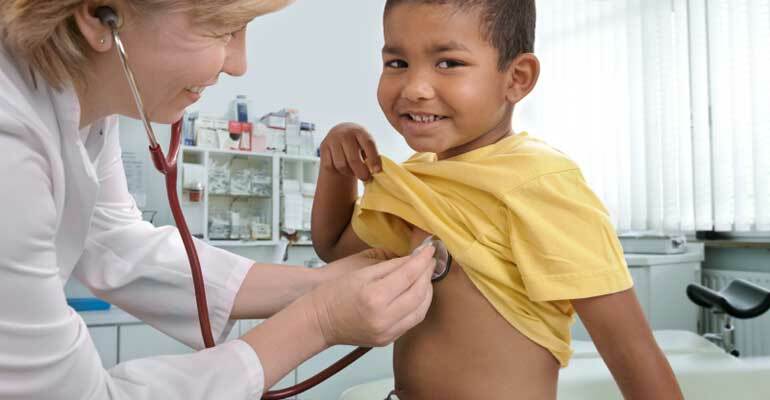 After a child’s placement in an adoptive home — whether via a domestic or an international adoption — there should be a review of all medical records and a post-adoption check-up that includes a complete physical examination and diagnostic testing — all taking into consideration the child’s past. Evaluate birth history and past medical history. In cases where these are unavailable, physicians must evaluate a child’s potential exposures from available information. Children exposed to drugs or alcohol prior to birth should be evaluated for blood-borne pathogens and sexually transmitted diseases, as should children born in countries where risks of those diseases are higher. This should include testing for syphilis, hepatitis B, hepatitis C, and HIV. Children who have been significantly malnourished, have been in institutional care, or who have lived in northern latitudes (where they may not have been exposed to much sunshine) should be tested for rickets. For children adopted domestically at birth, review of birth records should include attention to testing done on the birth mother, with repeat testing if records are unavailable or unreliable. All children adopted from another country should have a repeat of any pre-adoption testing. Assess risk for diseases. Children who have lived in conditions of poverty are at risk for infectious diseases as well as diseases related to environmental toxins and inadequate nutrition. Risk of exposure to tuberculosis is much higher in orphanages and other institutions, as well as in particular areas of the United States. Any child who has been adopted abroad should be evaluated for giardia and other stool parasites. A complete blood count should be done to check for anemia. Non-Caucasian children should have a hemoglobin electrophoresis to evaluate abnormalities in the structure of the blood hemoglobin. All children beyond the newborn stage should also have a test done for lead toxicity. A urinalysis can detect kidney disorders and urinary tract infections. Perform metabolic screens. In the U.S., all states require testing at birth for metabolic disorders that, if left untreated, will result in mental retardation. Physicians should verify that this testing has been done, or, if results are unavailable, repeat the test. Children under the age of one who have been adopted internationally should have a metabolic screen sent to the Department of Health of the state in which they live. Validate immunizations. If records cannot be validated, most immunizations can be repeated without harm to the child. Where records exist, in order to verify them, blood testing may be done to examine for antibody protection from previous immunizations. The same should be done for children who arrive from other countries with a written immunization record. With few exceptions, immunization records of internationally adopted children should not be accepted as written. Vaccines given to orphanages may be old or not refrigerated properly. Do hearing and vision screening. The American Academy of Pediatrics recommends hearing screening for all newborns and an eye exam in the first six months of life. Whatever your child’s age, screening early for problems will ensure that she is fully able to respond to her new environment. Carry out developmental evaluations. Children who have lived in foster homes or institutions are at risk for developmental delays. It’s worth assessing a child’s psychological needs, too. Is there reason to believe there is a history of abuse or neglect? Its effects may not surface until months or years after your child comes home, so this aspect of your child’s health warrants ongoing assessment. Experts in international adoption medicine stress that the country of ..